The blood-brain barrier (BBB) is a barrier which the passage of a substance carried by the blood t to the brain tissue. The blood-brain barrier was discovered by Lewandowsky and Glodman. In a experiment, Lewandowsky and Glodman observed that only the injection of acidic living dye into the subarachnoid space could stain the brain tissue, but it could not be stained by injecting into the bloodstream. This experiment proves that the existence of blood-brain barriers. Through anatomy studies, researches find that the blood-brain barrier is a barrier formed by the capillary wall of the brain and exists between plasma and brain cells. These barriers prevent certain substances (mostly harmful) from entering the brain tissue by bloodstream. Figure 1. 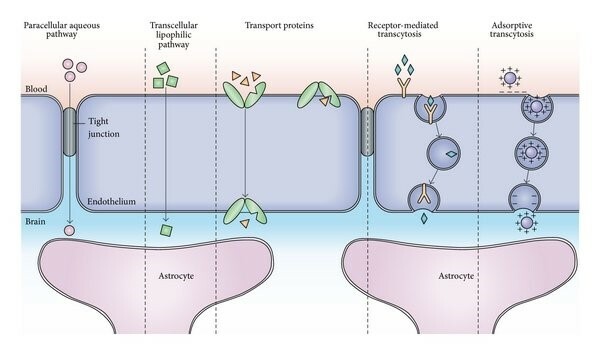 Pathways across the blood-brain barrier. The blood-brain barrier is composed of high-density cells that restrict substances from passing through the blood is far exceeding the endothelial cells in the capillaries of other parts of the body. These cells are called astrocyte foot (also known as “glial cell restriction factor”). Astrocyte processes surround the BBB’s endothelial cells, providing biochemical support for these cells. This “barrier” caused by the selectivity of tight junctions between CNS vascular endothelial cells limits the passage of solutes. At the interface between the blood and the brain, endothelial cells are stitched together by these tight junctions, which are a number of transmembrane proteins including occludin, claudins, connective adhesion molecules (JAM) or ESAM. Each of these transmembrane proteins is anchored to endothelial cells by another protein complex comprising ZO-1 and related proteins. The blood-brain barrier effectively protects the brain from circulating pathogens. Therefore, blood-borne infections of the brain are rare. But the presence of the blood-brain barrier also hinders the entry of therapeutic drugs, it is often difficult to treat when the brain is infected. In the clinical treatment of brain infections, the therapeutic antibody is too large to cross the blood-brain barrier, and only certain antibiotics can pass. In some cases, the drug must be injected directly into the cerebrospinal fluid (CSF), where it can enter the brain by crossing the blood-cerebrospinal fluid barrier. The study found that the blood-brain barrier is closely related to neurological diseases. Selective neurological diseases such as amyotrophic lateral sclerosis, epilepsy, brain trauma and edema, as well as systemic diseases such as liver failure may cause leakage of the blood-brain barrier. During inflammation, the blood-brain barrier becomes more permeable, allowing antibiotics and phagocytic cells to pass through the BBB. However, this also causes bacteria and viruses to penetrate the blood-brain barrier, such as toxoplasma gondii, toxoplasma, group B streptococci cause neonatal meningitis, and syphilis. Some of these harmful bacteria are obtained by the release of cytotoxins such as pneumolysin, which have direct toxic effects on the brain microvascular endothelium and tight junctions. The blood-brain barrier blocks 100% of macromolecular neurotherapeutics and more than 98% of small molecule drugs into the brain. Therefore, overcoming the difficulty of providing therapeutic drugs to specific areas of the brain is a major challenge in the treatment of most brain diseases. However, new technologies have emerged to provide new ideas for breaking through the blood-brain barrier, such as nanotechnology and peptide drugs. Recently, researchers have been trying to construct liposomes loaded with nanoparticles to enter cells through the BBB. At the same time, the study found that peptides can also cross the blood-brain barrier through a variety of mechanisms. These studies will lay the foundation for future research on neurological diseases and neuroscience.